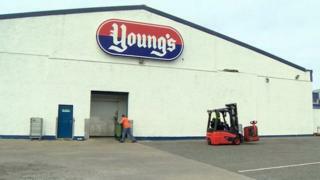 Cumaidh Young's Seafood na h-ionadan aca anns a' Bhruaich agus Baile Ùr nan Granndach fosgailte às dèidh dhaibh ath-sgrùdadh a dhèanamh, ach thuirt a' chompanaidh gun tèid timcheall air 650 cosnadh a chall. Chaidh obraichean aig Young's a chur ann an cunnart nuair a chaill iad cùmhnant luach £100m airson bradan a chumail ri bùithdean mòra Sainsbury's. Thuirt Young's gun sàbhail am plana 250 cosnadh a-mach à 900 a bh' ann an cunnart. Bha iad ag ràdh nach b' e co-dhùnadh furasta a bh' ann roghnachadh 650 dreuchd a ghearradh. Thuirt Àrd-Stiùiriche na companaidh, Pete Ward, gun tàinig iad gu aonta leis na daoine a chailleas an obraichean agus gum feuch iad ri an cuideachadh gus dreuchdan ùra fhaighinn. Thuirt Riaghaltas na h-Alba gun stèidhich iad buidheann-gnìomha gus taic a thoirt dhan luchd-obrach agus na coimhearsnachdan air an toir seo buaidh. Thuirt Ministear a' Ghnothachais, Fearghas Ewing, gur e bristeadh dùil a th' anns an naidheachd gun caill uiread de dhaoine an obair, ach gu bheil an Riaghaltas toilichte gun tèid na h-ionadan anns a' Bhruaich agus ann am Baile Ùr nan Granndach a chumail fosgailte.